Paperback; 65 pages. Reinforces a customer orientation and develops key customer-oriented behaviors. Self-assessment and practice exercises make employees more conscious of customer needs and adept at meeting these needs daily. 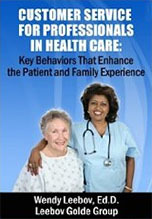 Terrific text for staff development and improving customer service in healthcare.